The Total Lunar Eclipse of October 08, 2014 was nearly a no show here in Riverview, FL with poor weather conditions we were experiencing. This shot was taken near totality at 6:26am through a haze of cirrus clouds, as the moon loomed approximately 15-20-degrees above the western horizon sporting a faint halo. 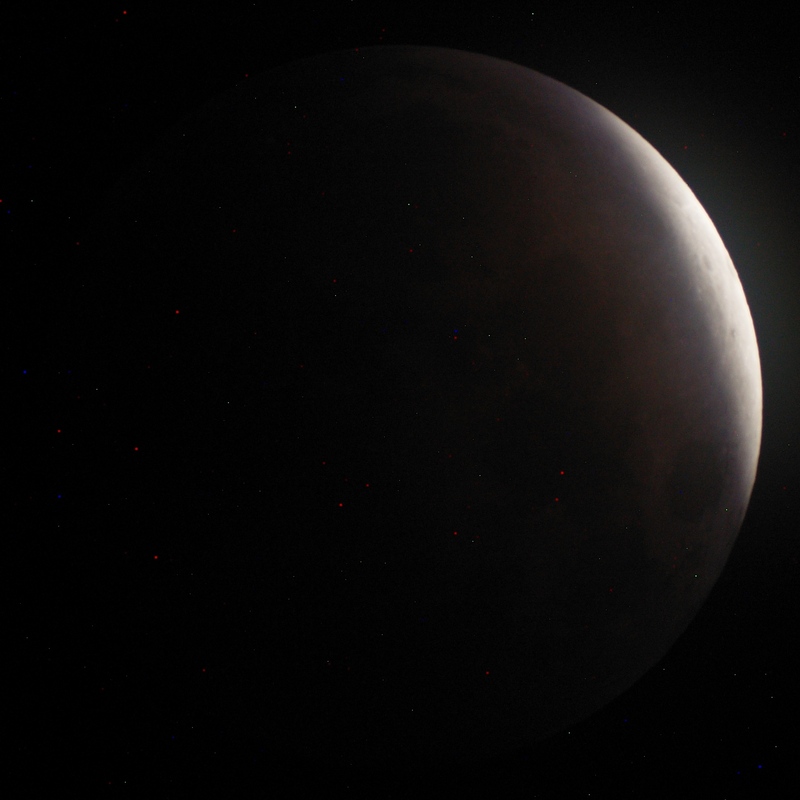 This image taken through my Meade 102ED f/9 refractor with Oly E-500 DSLR at the business end. Click the above image for an enlarged view!! 102mm f/9 "Meade 102ED Semi-APO Refractor - Used to view and image the eclipse. Vixen Super-Polaris EQ mounted w/ Orion TrueTrack dual axis drive system atop my homebuilt North Star II Field Tripod - Used to track the eclipse. Celestron 12v Rechargeable Power Tank - Used to power equatorial mount. Olympus E-500 8 Mega Pixel DSLR - Set to ISO 400 using varying exposure times to image the eclipse. HP Pavilion G7 (Windows 7) Laptop Computer running Olympus Studio 2 - Used to manipulate camera remotely. 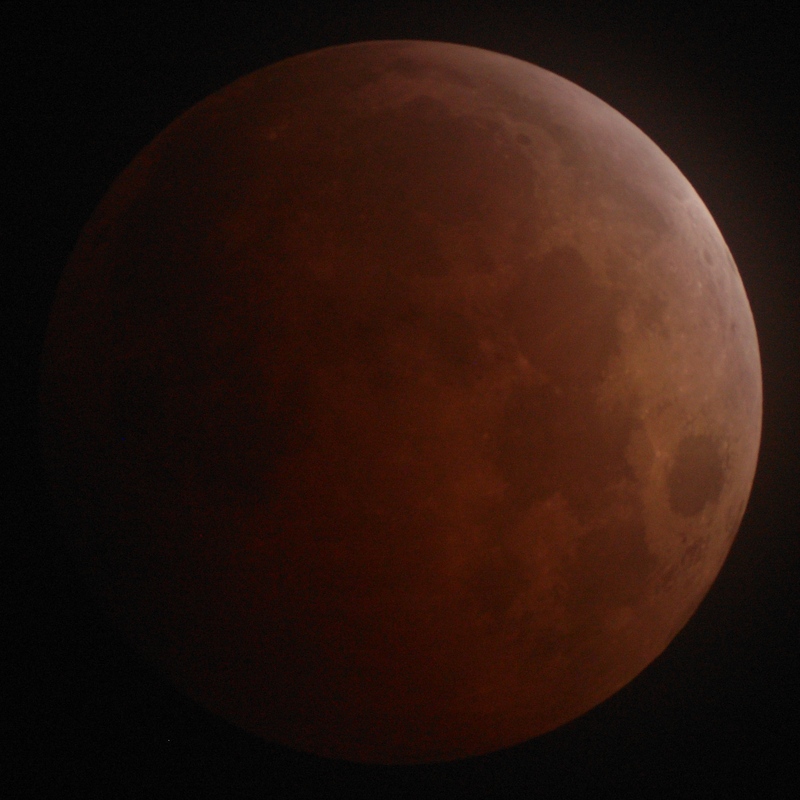 Imaging the October 8th, 2014 Total Lunar Eclipse at a feverish pace, Mel Dawson imaging setup is pictured here. He was also speaking with Gary Barabino of the VSC-1 in Slidell, LA over the phone as they observed the event jointly. Click above image to enlarge! Here is a shot of the Meade 102ED 102mm f/9 APO refractor with the partially eclipsed moon in the background. Click above image to enlarge! 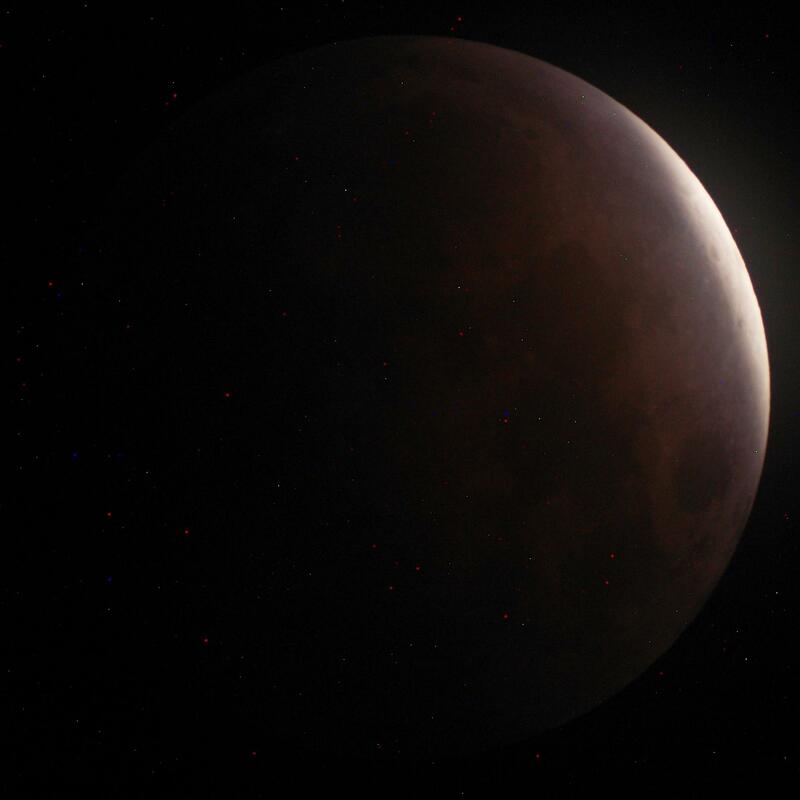 Here a sleep depraved amateur astronomer by the name of Mel Dawson does his best to push out a smile during the dismal weather beaten Total Lunar Eclipse on the morning of October 08, 2014. Click above image to enlarge! The below collection of images of the October 08, 2014 Total Lunar Eclipse were capture via Prime Focus by Mel Dawson of the Vega Sky Center 1 in Riverview, FL were captured using his Meade 102ED 102mm f/9 Semi-APO refractor with a Olympus E-500 DSLR. Please read the synopsis below to engage on the experience as witnessed by Mel Dawson. Click each photo below to reveal an enlarged image. 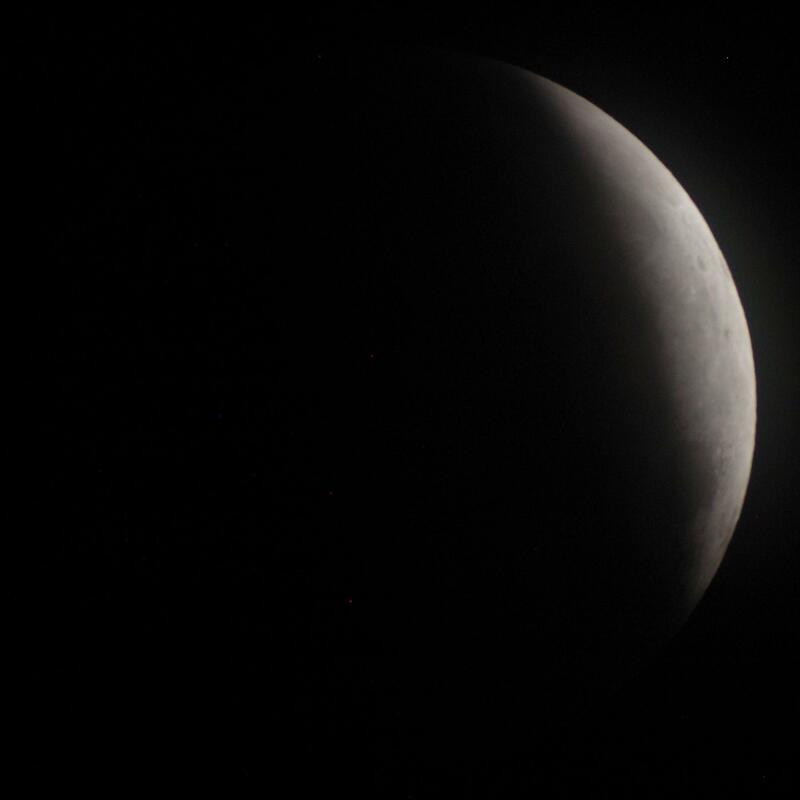 You might think that I would be totally upset with the images I showcase here in this observation of the Total Lunar Eclipse of October 8th, 2014, but you would be wrong. Oh! ...you ask why? Well, if you had the opportunity to experience the weather conditions I had to deal with prior to the advent of this eclipse, you may have wondered why in the world did I bother hanging up missing a comfy nights rest. But faith prevailed, and the weather conditions improved slightly just around the time the eclipse begun. Offering an opportunity to capture some decent images that I am portraying below. It was approximately 4:30am on the morning of the 8th that I arose and stepped outside thinking I was going to see the previously overwhelming alto-cumulus a.k.a. “Butter Bean” clouds, which covered the entire sky. But, I was blessed with a hazy film of cirrus-stratus clouds that offered an acceptable view of the moon, so I rushed to setup my equipment. Though most amateurs would have given up, I held on and pushed forward in getting this observation recorded regardless of the nearly unacceptable viewing conditions. Like I said, I was truly blessed to get the opportunity to record this event. My backyard observing setup consisted of a Meade 102ED F/9 APO (I call it a semi-apo since it has a high-end doublet objective) riding an old-school Vixen Super Polaris EQ with Orion TrueTrack dual-axis drive system setting atop my North Star II field tripod. Images were captured with my Oly Evolt E-500 8 megapixel DSLR at prime-focus connected via USB to an HP Pavilion G7 laptop using Olympus Studio 2 software for hands-free operation. The first image was captured at 5:48am EDT, well into the beginning of the eclipse. 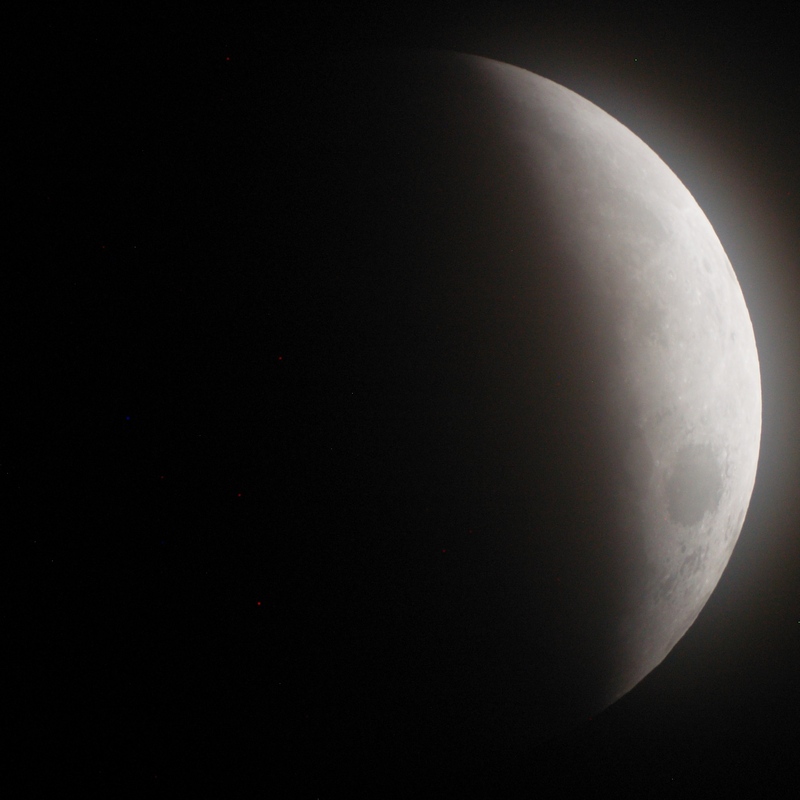 As you can see in that image, the cloud haze really sucked the life out of the moon's surface detail and earth's shadow. The haze gradually improved giving me progressively better views, but not to the point where I got totally clear skies. A halo also grace the moon during the start of the eclipse was about 25-degrees in diameter. It looked ominous and beautiful at the same time with a partial bit from the umbra of the earth's shadow. Wished I had time to take a photo of it, but with me not being proactive in getting my setup operational prior, I decided to focus on imaging what little I could of the lunar eclipse. As I was finishing setting up my equipment, Gary called a to let me know he was up and had his setup ready for imaging. He had a bit of a head start on me, being that he had nice viewing conditions. As we observed, Gary ask me if I was familiar with Tetrad. I told him I heard of it, but could not recall what it means. Well, in my research I discovered that a Tetrad of Lunar Eclipses means a sequence of four back-to-back total lunar eclipses. It does not matter what year or time period. It just means in a roll, and this particular total lunar eclipse is the second in the series, which the other two will be visible within the United States also. The weather conditions continued to improve gradually during the eclipse's time frame. Winds were little to none, and the temperature was about 72-degrees Fahrenheit. Perhaps if we had a 5 mph breeze, i think it would have been sufficient enough to push the wispy clouds away. Oh well... You win some, you loose some. Using the Olympus Evolt E-500 set to manual, my initial exposures were at 1/4th of a second and progressed up to 5 seconds at ISO 400 on the last photo, using the prime-focus method (see camera setup in the photos below). The image was reminiscent of the August 16, 1970 Partial Lunar Eclipse because of the amount of earth umbra shadow covering nearly one third of the moon's western portion that included a major chunk of Oceanus Procellarum. Totality was reached at approximately 6:26am EDT. 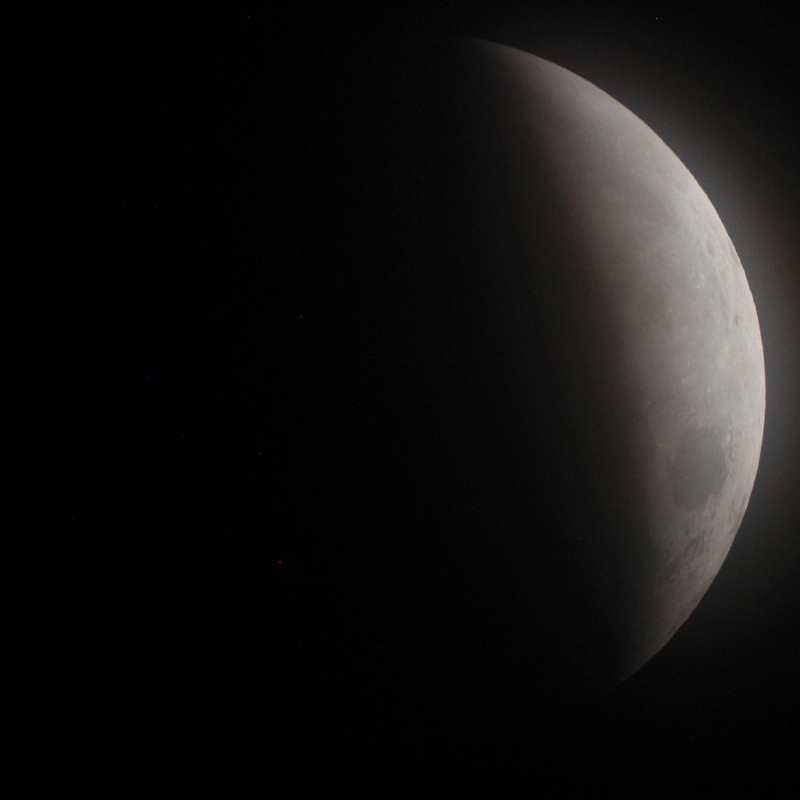 It was hard to be sure, with all of the haziness around the moon during imaging. At the VSC-1, Gary was business capturing his own collection of images. His skies were much better than mine, so I am hoping he got some great shots. He used a Yulin 127mm f/9.4 achromatic refractor with a Evolt E-500 DSLR; one identical to my DSLR. I hope Gary will be putting together an observation so I can post it on our webhub too. Consider the weather conditions the Meade 102ED refractor had to endure, it truly did a great job imaging the eclipse! I can not wait to use it for the October 23rd, 2014 Partial Solar Eclipse. Especially with a clear turbulent-free skie. 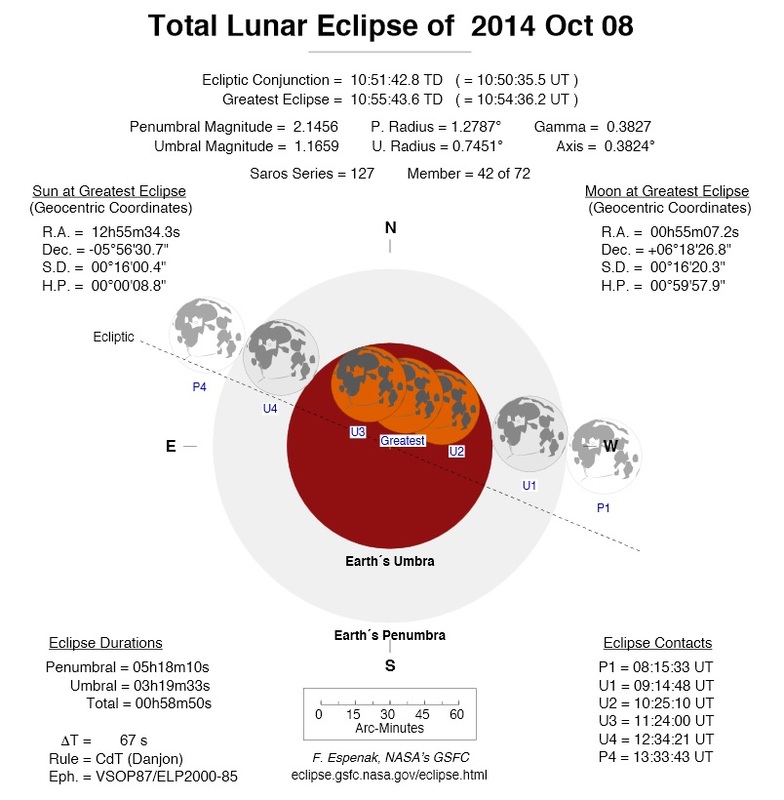 The moon's projected path, as it traversed through the earth’s shadow during the 10/08/2014 Total Lunar Eclipse. This chart displays the geocentric zones depicting the areas of visibility of the eclipse. Riverview, FL and Slidell, LA were positioned in zone U3 viewing area.